This piece on garden fences was written by freelance contributor Sally Perkins. Manicured lawns are beautiful and desirable, but are not always easy to obtain. Making them look nice requires a lot of work, and some extra knowledge. Grass grows fast, especially during the rainy months, so keeping it at bay is often a weekly chore. You’ll need to mow the lawn often, and you’ll need to manicure the areas around the fence. The lawn mower simply cannot get the blades of grass closest to the fence. When you’ve got a great fence to preserve, you don’t want to ruin it with dangerous lawn mower blades. Use a weed eater with a line, not a blade, to trim the edges near the fence. The line weed eater will be easier and cheaper to repair than the blade version, if it accidentally hits the fence. You’ll need to trim the grass near the fence without touching it to avoid damage. Use the trimmer a half inch away from the fence post. If it is possible, shorten the bottom of the fence posts by three inches to allow the trimmer to reach underneath the fence. If this is not possible, consider aluminum tips to protect the fence against the trimmer. When trimming around a chain link fence, time and patience work best. Carefully trim between each fence portion to clean away the grass. Think about using mulch around the bottom of the fence posts to reduce the amount of growing grass. This is why many people include flowers at the bottom of a fence. Flowers such as marigolds or daisies look wonderful around a fence, as do small garden statues to help reduce grass growth. If flowers are out of the question, however, placing a small ring of mulch around each fence post will go unnoticed among a larger yard. Simply apply a circle of mulch a half inch thick around the posts to hold back grass growth and reduce fence damage. You’ll be able to control the lines around the fence post, and, if done properly, you’ll be able to mow without worrying about the fence line. One thing to keep in mind though, is to always change the lawn mower blades, when they get dull. 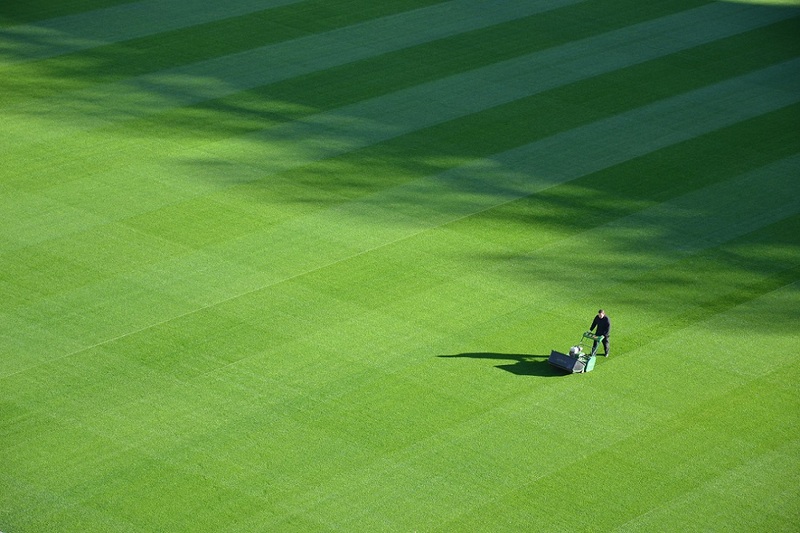 Having sharp blades will naturally ensure perfectly trimmed grass. Trimming the edges before mowing the lawn leaves cleaner lines. Using mulch or planting gardens around fence posts reduces grass growth. Using a gentle, line-fed trimmer helps keep the lawn looking evenly kept. Using these general tips helps maintain a beautiful yard without damaging the fence.